I met Brandon Eley at the Ecommerce Fuel conference and I can honestly say that he was one of the most well-spoken and intelligent entrepreneurs that I’ve ever met. Brandon runs 2BigFeet.com, which is an online store that sells shoes specifically catering to people with big feet. 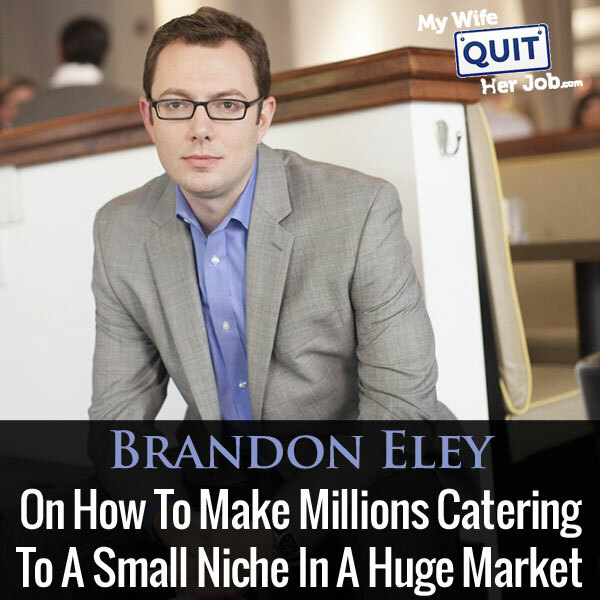 Not only does his store make 7 figures but Brandon also runs a successful blog at BrandonEley.com and is a prolific speaker specializing in online marketing and ecommerce. Don’t miss this interview! How Brandon leverages email marketing to boost his sales. Steve: Welcome to the My Wife Quit Her Job podcast. Today I’m really excited to have Brandon Eley on the show. Now Brandon is someone who I met at the ecommerce fuel conference in Austin Texas last month and he runs the incredibly awesome site 2bigfeet.com, which you guessed it sells shoes for people with really big feet. Now here is what’s cool about 2bigfeet.com. On the surface you would think that selling shoes online would be over saturated, but Brandon found a niche where he could truly make his store unique and stand out among the competition. Now this just goes to show that running a successful shop online doesn’t necessarily mean that you have to invent the next big thing, you just have to find that special something to make your store stand out even if you sell well known products like shoes, and plus you have to be smart and a hustler like Brandon, and you know what they say about guys with big feet, right? So welcome to the show Brandon, how are you doing today? Brandon: I’m great, how are you? Steve: Pretty good man. So you’ve actually got a really interesting back story about 2 big feet and you’ve got a lot of kind of failure stories and mistakes to share, and so I thought you know to begin this interview, what’s the background story behind 2bigfeet.com and I kind of want to hear about some of the mistakes that you made early on with your partner. Brandon: Sure. Well when I was 19, I was an intern at the company pretty big company had about 500 employees. The guy in the office next to me had really large feet, he had size 16 shoes, and he came over to my office one day and told me a story about how he always had a really hard time finding shoes in his size. And in a rural area, or suburban area not one of the major metropolitan hubs in the country, if you walk in a shoe store and ask you know can I see this in a size 16, can I see this in size 17, they will literally laugh at you. This is true in the 90s, it’s true today, and so he ended up having to just walk into a shoe store and ask “what do you have in a size 16?” And they would usually bring back one pair of ugly sneakers that had been in the back room for a couple of years, and that was all he had to chose from for years and years, and even as an adult he had a really hard time finding shoes that were appropriate for work, finding shoes that were appropriate for church. So he came up with the idea and asked me if I could build him a website and at the time I had never done anything with the internet or built a website, I didn’t know HTML or anything. So we both quit our jobs and raised a little bit of money. It was trial by error for the first few years. I think it took us three years before we ever even hit $100,000 in revenue. Our third year we passed $100,000 in revenue. So it was a real struggle in those early days as we were just teaching ourselves how to do everything. Steve: So you know what were some of the early mistakes that you were talking about? When you were first starting out? When you didn’t know what you were doing? Brandon: Well I think one of the best mistakes we made was hiring search engine optimization company that back in the days of doorway pages and keyword stuffing and not knowing anything about what was white had a black had– we just took them at their word, they said they would get you to the top of the first page in Google and we trusted them. And so we spent many thousands of dollars a month with them for a few months and ended up in a worst situation than we were when we started because instead of just being low in the search engines– of course we were kicked off the search engines, we were gone and we had to just start slowly building our way back. Of course we started using paper click because it was the only way we could actually get traffic to our website. Steve: So just curious what is your opinion on outsourcing SEO today? Brandon: My opinion on outsourcing SEO is the same as my opinion on outsourcing any service like marketing SEO paper click, and as that you really have to understand the fundamentals of anything that you are going to outsource. If you are a business owner and you want to outsource the book keeping you need to understand everything you can about book keeping not on the micro level but on the macro level. You need to understand for instance with SEO what’s white hat and what’s black hat. Read the Google overview, the guides that they have which aren’t that long, it won’t take you that long to really get up to speed on what Google thinks is appropriate and what would get you in trouble. That way when you are speaking with a contractor or a vendor you understand enough to know if they’re telling you the truth or if they have experience doing what they’re doing, and you can usually spot the ones that are not going to work out for you. Steve: Okay and then you also mentioned PR agencies as well, so you have experience contracting that out as well? Brandon: We did in the early days we hired a PR firm that did us no good whatsoever, they– I think we paid them either three or six months and it was several thousand dollars a month; never got an interview, never got an article written about us, never got really anything. In fact the only PR we ever really got was when we did get pretty much kicked off of Google during the Florida update. We reached out personally to a lot of people that we knew. My partner knew a reporter for the AP at the Albany Herald and he wrote about it and it got picked up on the AP south wire I think it’s called, which hit every newspaper in the southeast and that landed us a national NPR interview on the NPR radio show. Brandon: And we actually filmed a Discovery Channel documentary at one point and our segment didn’t end up airing, but it was really– that was the best PR we ever got was getting kicked off of Google. Steve: So it sounds like some of that early PR was just a result of your own hustling as opposed to anything that any agency did for you, right? So would you recommend going with the PR agency today, like do you have one today or do you still do your own PR stuff? Brandon: We don’t, we don’t really do a lot of PR right now. Brandon: We focus more on the marketing we really can control. I would, I would definitely be interested in going with another firm in the future. I think PR is tricky though, you really have to have a really well crafted story that’s going to resonate with reporters, or talk show hosts or you know the producers of shows to get you know if you just have some product that is not truly unique or really innovative or you know you just have a really good story, it’s going to be really tough to get any coverage. Steve: Okay. That makes sense yeah you know I want to talk about the nuts and bolts of your business, because there’s actually several students in the online store course that I run that want to sell shoes. Now obviously they don’t want to sell shoes for people with big feet, but you know some of the other more specialized shoes. So I thought I ask you a couple of questions about sourcing. So first of all let’s say I want to sell shoes, where do I go to source the shoes and do you actually have to carry inventory or can you dropship? Brandon: Well when we got started in 1999, it is about the same now as it was back then which is sad. The shoe industry is obviously one of the older industries out there and it’s very slow to change. To find inventory you go to the manufacturers directly and you open accounts with them, and the vast majority of them will require you to have a physical presence. That doesn’t always have to be warehouse and retail store, but many times it does. For instance even though we do the vast majority of our business through internet and phone orders, we still have a small retail store just to satisfy the handful of our vendors manufacturers they require. So you go directly to the manufacturers like New Balance or Keen or Timberland or whoever, and you open an account directly with them and they usually have minimums for the first opening order. We have hidden a password; they only have a couple of shoes that go up to big sizes and then trying to order those just couple of shoes, we didn’t quite hit the minimums. So then usually a few thousands of dollars to get, and many of them don’t drop ship, so you’re required to stock your own inventory. Steve: Okay and so given that how you kind of decide what sizes you need to carry earlier on and what are the some of the logistics involved? Brandon: Well we learned by trial and error what sizes worked for us, our biggest sellers were size 16, 17, and 18. Brandon: Which is going to be a lot different for a traditional retailer. We start at size 14, so we don’t have anything lower size 14 in our warehouse. The people who find us, who search for size 16 size 18 still put boots or whatever they search for long tail on Google, they find us because they can’t find anything else. Brandon: In traditional even online shoe stores. Brandon: So our makeup of the size ranges is a lot different than the traditional shoe store. I think the sales rep in the shoes– in the manufacturers you know they can give you a really good idea what’s the best selling sizes, what are the best selling styles, that doesn’t always work out. Some of the best selling styles that we bring in don’t do so well with our audience; you have to learn by trial and error. Brandon: But it’s you know with the style of shoes you’re not going to bring in 1000 pair of one particular style, you’re going to bring in a few dozen and if it doesn’t sell you mark it down, you get rid of it, you bring in another style and try out. Steve: Okay and have you ever thought of running your own styles in your own brand, or has it been just all third party stuff so far? Brandon: We have early on– not too early on probably about five years in, we created our own brand of dress shoes and we made them up to size 24. Brandon: And we had the manufacturer and lay on Mexico. We actually went there and met with the factory and went through a broker here. It’s a really complicated process to do it all on your own, to actually build a brand and go to the factories and try to source it yourself. So we didn’t do that again, it was expensive, we didn’t get the margins we were hoping for back then. But I would definitely be interested in doing it again at some point, but one thing that has worked really well for us is we go to the manufacturers we already have relationships with, they already own the factories or they have really large or strong relationships with factories in China, in Mexico, in Argentina and we say can you make this particular style, that particular style for us the way we want it in the sizes we want. Sometimes that means buying 1000 pair, but that’s better than trying to you know fly to China, find a factory to make just 1000 pair for us. Brandon: They’re making tens of thousands or hundreds of thousands of pair for the manufacturer. Making 1000 in big sizes is much more feasible through them than trying to do it on our own. Steve: Okay and then these are just kind of existing styles that you want them to make larger sizes of for you, right? Brandon: Sometimes and sometimes we’ll have them you know, they’re more than happy to customize, a lot of the smaller manufacturers you know not your multibillion dollar conglomerates like New Balance or Brown Sheet brands, but the smaller companies that are in the 50-100 million dollar range, they’ll be more than happy to do custom runs and make things and tweak them. If you are willing to buy enough merchandise they will put their factories to work for you. Steve: Okay and then in general D margins on those shoes are higher or…? Brandon: Not so much, they are a little higher. We do get more of the keystone in the shoe industry is you double your price so if we buy a pair of shoes for 50 dollars we retail or sell for 100. Brandon: And you get a little bit better than that if you are buying 1000 pairs or something like that, but you have to really get into buying a whole lot of pairs, and that’s a lot of pairs to sell. Steve: And that’s a lot of money upfront too right that you need to foot. Brandon: They will want it in 30 or 60 days. Steve: Okay and so okay, so you mentioned a couple of things, so the margins typically for the shoe industry is around 50%, is that what you said? Steve: Okay. So given that there is a lot of people that sell shoes and chances are there’s probably a lot of stores that sell large shoes, how did you actually get customers into your shop early on? Brandon: Well, we’ve always focused on search engine optimization even when we didn’t really know what we were doing. Brandon: And the vast majority of our traffic does come through organic search. Brandon: We are currently getting about 64% of our traffic and 55% of our revenue from organic search, which is good because it’s cheap but it’s also a little bit scary because if Google changes their algorithm you could be in a lot of trouble. Steve: Okay. So what are some of the special things that you are doing to optimize your cipher search? Brandon: We definitely focus on the long tail key words, so we have pages for each sizes we carry, we specify each size that we carry on each product. Steve: On a separate page– sorry. Brandon: Yeah. We have pages for each particular size and then we have on our product pages themselves, we list every size that is available, and you know we have brand pages, vendor pages, we have detailed product pages, and we try to just go into as much information as we can. You know a lot of the shoe manufacturers will give you a little blur but this just like steel toe, slip resistance sole, meets antsy whatever ratings, that’s kind of all they give you on a description. They don’t go in and write these complex products descriptions. So we have to write the product description from scratch, and that helps us a lot and a lot of our competition just simply puts up the specs. Brandon: Of the shoe and then really write anything unique, and then we target some of our better selling categories, like for instance restaurant shoes, these are really big categories. We found a supplier to provide us with a restaurant shoe in big sizes that’s really affordable, and it’s slip resistant and it’s made specifically for that. So we’ve got an entire page for restaurant shoes. Brandon: And so if you type in, in size 17 restaurant shoes we’re very likely to come up at the very top of the first page. Steve: So just curious those products where you are putting in different page for every size, is the content on those pages different, like do you write specific descriptions for each? Brandon: No, we don’t because I guess because our niche is so small. We’re going to have to go into a whole lot of– I mean there’s only so much you can write about size 17 versus size 16. Steve: Right exactly which is why I was asking yeah. Brandon: We try not to keyword stuff too much. We try not to artificially inflate the pages by simply having a good URL structure and passing the page link logically through the home page, and we do know follow a lot of pages all pragmatically know follow any page. For instance if we have a product listing and the image linked to and the product name links, we are very careful not to pass any page link we know follow the picture and anything that says click here, we only pass it on the product name and then we only pass it on certain ones not only just to add. Brandon: That we might have, so we try to pass page link a little bit logically, so more of the page link goes to the pages we want to. Steve: So do you kind of consolidate those products with different sizes using like the canonical tag or anything like that, or is it– are those just separate pages that you’re trying to rank? Brandon: Which ones are going to get the most page rank and which ones are going to be the least, we pass it through the links we want to and just followed by half the links on our site and it seemed to have worked really well for us. Steve: Okay and then in terms of where the search traffic lands, would you tend to say that they are more landing on like the category pages on your brand pages that you have created as opposed as to the actual products themselves? Brandon: They do and we do have a lot of people land on product pages, and a lot of those are actually because we rank so low for a lot of products without any keyword, like size 17 or big or large, those are bounces. So we have a higher bounce rate when people land on our product pages because they are often times coming just looking for you know a new balance 621 running shoe. Brandon: And we rank well for it even though there’s no identifier for large size big or whatever. So those are often bounces, but we do get a ton of traffic on our category pages on our individual sites pages people who type in size 17 shoes and our brand pages. Steve: Okay. So in terms of search engine traffic, so that’s a large portion of your traffic but early on it takes a while right for the search engine traffic to kick in. So what were you doing prior to the search engine traffic kicking in to get customers to your site? Brandon: A lot of things that didn’t work. Brandon: We did banner ads. Brandon: We did radio ads like traditional radio ads; this is before podcasting was even a thing. I think it was before the iPod even came out– when did that happen, two thousand and something? So we did radio ads on South Eastern radio stations, we did a bill board one time. Steve: You mean like on the freeway? Brandon: On the freeway yeah, when I say we made every mistake you can possibly make in that business– you know we had never built an internet business and there were no books or courses at college campuses about how to build an internet business, it was all trial by error. So we learned pretty quickly what didn’t work, but once we found paper click that’s when we really started being able to buy traffic and early days paper click was so affordable, it’s still really affordable for us. But back then we were able to just put as much money as we could in to paper click, and that was our saving grace in early days because we could pay for the traffic coming to our site and we could target it on someone searching for size 17 shoes or size 18 shoes or you can use negative keywords to remove the categories that we didn’t sell or brands that we didn’t sell. Steve: Okay. So let’s go into that a little bit more, so you are talking about ad words in particular or which paper click services do you use? Brandon: We have used them all; I remember using overture back in the day. Brandon: But right now we are primarily using Google. Steve: Okay and then this is just search ads or everything like the product ads like Google shopping? Brandon: We do– currently we are not on pro listing ads, we’re trying but we have a hard time because you can’t specify product listing and you can’t specify what [inaudible 00:21:15] you want to show up under, you can only specify things you don’t want them show up. Brandon: And because what we sell, the products that we sell are only available in certain sizes. We don’t sell that product in a size 11 or 10 or 9 you know you look up our new balance 623 running shoe, and my product listing ad shows it for you then I’m losing money because our conversion rates on those are much lower. Some– our company that manages our paper click is looking in how they can tweak our ads with enough negative keywords or tweak our ads with the right product names with the particular size and the product name. So they only trigger when we want them to so far it hasn’t really worked out for us. So most of what we are doing is just in the text ads and they’ve done a really good job. We use a company called White Shark Media. Brandon: And started using them a couple of years ago and I’m a Google ad words surf a consultant. So I mean I went through the whole test and got certified several years ago. So I’ve always done it myself thinking I’m certified I can do a really good job, and they just blew me away with our cost per customer acquisition, it cut in half when a few months after we started using them. Steve: What are some of the things that they’re doing differently that you couldn’t have done? Brandon: Well they have the time you know being a business owner I have tons of things to work on and I will very solemnly go in and tweak my campaign and they go in and tweak it several times a month and any keywords that are not converting they pause. Anything that’s coming through you know for a brand we don’t carry or a size we don’t carry they add negative keywords to get out of that. Brandon: So they’re really prudent about going in meaning they send me a report every single month we can only find every month and talk about how they are tweaking the campaigns to work really well, and they are also working with some product listing ads and remarketing, that’s another thing they do for us. Steve: Okay and this is display remarketing or do you do search and text remarketing as well? Brandon: We do, we do both. Brandon: We have traditionally only done it in holiday shopping season. Brandon: The first company that we used for remarketing I wasn’t really happy with the return that we were getting. We used– I’m trying to remember the name of the company. It was one of the huge ones and we just weren’t really happy. I mean it was costing us a fortune and when I looked in my analytics even with the tracking codes present, I wasn’t seeing many people came back and converted. Now they said that we had many conversions, but I wasn’t seeing any ROI analytics and I think it wasn’t coming through analytics I really didn’t trust them. Steve: So let’s talk about remarketing a little bit. What customers generally do you bring back to your site, just anyone who’s visited your site, anyone who has inserted something in a shopping cart, like how do you kind of segment your retargeting list? Brandon: The way we did it is we cookied them when they came to our site and we looked at individual brand pages or category pages, and we specifically excluded anyone who had already converted. Brandon: And a lot of times in the holiday season when we ramp up and start spending more money we’ll only retarget people who added something to their shopping cart. So they got something in their shopping cart but did not convert. So we know that they were invested enough to actually check out the shipping prices, or they were really deep in the process, they were in the cart. And then we do have a really good conversion rate on retargeting those people by saying come back you forgot something in your cart or come back for a 5% discount, and getting– because our shopping cart currently doesn’t have cart recovery. Brandon: That was one way we kind of did the cart recovery through remarketing. Steve: So you offer a coupon, do you ever run these retargeting ads without a coupon or a price base incentive? Brandon: Absolutely yeah, we don’t do a lot of coupons. Brandon: So any buyer that chooses to be on our site, we will remarket on the general campaign, we don’t offer any kind of discount, we never really do. I have tried some coupons before on email signups and offer a $5 off first time customers to sign up for email newsletter, but we rarely do real deep promotions or coupons just because we have to warehouse everything and our margins aren’t really that deep. Steve: And so when you remarket, do you remarket very specific ads based on exactly what they look like looked at, so for example if someone was looking at Timberland shoes do you retarget them with an ad– with a picture of a Timberland shoe? Brandon: No we usually do brand ads because of just the time in creating multiple ads. We have even as few products as we have compared to a large site like Amazon, we have hundreds and hundreds of different products and we find that a lot of our customers being that they’ve never been able to shop for big shoes, a lot of our new customers will look at dozens of products. Brandon: You know [inaudible] [00:26:25] average time on site is pretty long, it’s looking at– let’s see four minutes average time on site this year. Brandon: The average person looks at more than five pages. Steve: I’m just curious what is your conversion like for your retargeting efforts? Brandon: Last year we ran around a holiday season. It was not as good as we wanted it to be. In fact it was lower than our overall conversion rate which is why we are going with White Shark, I looked it up– the company we used last year was admiral. Brandon: And you know they offer what they say is come like hands off, you just go within they wouldn’t help you with your creative and everything. Brandon: But the information that we were getting, I mean we– at least in Google analytics it was saying we were getting virtually no conversions, but what they were saying is there were view through conversions. Steve: Yes yeah exactly, that was my experience also. Brandon: So they would say that somebody viewed an ad and then came back later and bought which we have no way of tracking. They said it was– they would say you know see an ad so I don’t trust that really. I want somebody to see it, be compelled to click on it and actually you know I want to be able to track it in my view of analytics that we actually got that conversion. So we are going through Google directly now and White Shark is getting our campaign ready for this holiday season. So I’m excited to see what difference we get this year since last year. Steve: Yes you know one thing the reason I kind of asked you that question about you know you would target your people is because I found that with our store retargeting people that just landed on the site period as opposed to targeting those people who inserted something in their cart and abandoned ended up being higher for some strange reason and it’s all due to experimentation. I was just wondering if you had experimented with that as well. Brandon: We seem to do better with people who’d put something in their cart and somehow got distracted. A lot of people and this is something that live chat has helped us a lot with is a lot of people would put something in their cart and have a question. And if it’s after our business hours we are not answering the phone, they would just kind of go away. They wouldn’t really– we found that people don’t really read. They don’t read the frequent asked questions. They don’t search how to answer. If they are confused then they pick up the phone. Brandon: But they are much more likely to hit that live chat button or just kind of they’ll eventually get busy doing something else and totally forget about it. Steve: So do you have someone live manning that? Like the whole business day? Brandon: We are not as good as we should be. Brandon: Like I should really be manning it right now because our employees are out in the warehouse packing and shipping right now so they are not able to look at it, but we try to man it most of the day every day. And often times even when I’m at home I’ll go ahead and pull it up because it dings pretty you know I’ll turn my volume up on my Mac, you know ding really loud when a customer clicks the button, so we’ll run over and check it out even if it’s at ten in the night. Steve: And when it’s not open, when you are not able to do live chat you hide the box, right? Steve: Okay. I had a couple of questions that just kind of popped into my mind. Do you take your own product photos or do you use the stock images from the manufacturer? Brandon: We do because we’ve always taken our own product photos. We do have a few brands that will give us product photos that look descent, but initially I’m kind of OCD about some things. And one of the things is that I want you know a little bit of consistency in the product photos. Brandon: And I found that some companies send us straight on product photos, some people send us product photos in an angle, some with the left shoe, some with the right shoe, some with both shoes, some are high quality, some look you had some kind of background in them. And so we decided early on we are going to take our own photos. And we used to use one of those fold up translucent white box things that you put lights on the outside and move them around until they are just right. And it took a lot of time. Every season we get a new style, so two to four times a year we are getting pretty large shipments of shoes that we never sold before. So we were spending days you know setting up lights and moving them around just so there wasn’t too much light on this part or that part was blown out, and we finally just invested in a really good professional white box. We have– it’s called an Ortery Photosimile. And they are not cheap, but being that we take all our own photos, it does what most I’d say we take 95% of our photos. It does a really good job. Steve: Okay and so basically it’s just put the shoes in there, it’s already set up, lighting is perfect and you just take the shot and you are done, right? Brandon: You just take the shot and I do I like a totally white background. They would look fine if you didn’t edit them at all, but you can see you know obviously even with the perfect lighting you can still see the background. You can still see what’s behind it. So we have a company that outsources I think it’s in the Philippines maybe. And I just upload all the photos that I shot and they cut up the background and even touch up the photo a little bit if there is hair on one of the shoes or you know just a little dot or something they will remove those little blemishes and I think they charge per 2 or 2.50 in image. Steve: Okay and then in terms of pricing your products since these are just products from manufactures is there any lee way on pricing for you or is basically any time you discount goes straight you know off of what you are going to make in terms of– so what I’m trying to ask is there a map pricing on these shoes? Brandon: There is and a lot of the manufactures kind of bully you into pricing things at map. We do close things out after the season or if a company is no longer making something in big sizes which happens a lot with if a brand has a product that’s not selling really well, they’ll cut the big sizes. And they may still sell for another season or so, but they won’t make our sizes. So when we can’t get them anymore, if they are not selling we’ll close them out, but it’s just come to straight off our margin. Brandon: And they really don’t like for you to do that. If you do it too often a brand, a manufacturer will drop you from selling their products. Steve: Okay. Let’s go back to pay per click for a minute. Do you do anything on Facebook right now? Brandon: We have done Facebook in the past and I’ve learnt a lot more about Facebook with the last few conferences I’ve been to and really want to put some of that knowledge to test, but the only thing that I found with Facebook that has done anything for us was using the fairly new custom audience. Steve: You target the NBA. Brandon: Yeah people who like the NBA, but what we did is when they released the custom audiences we uploaded not our email list but our entire customer data base. Brandon: Which after 15 years being in business it’s tens and tens of thousands may be a hundred thousand, I mean it’s a huge list and that was very successful in giving us likes. We didn’t try the campaign to try and get people to buy because these are people we know have bought before, we just wanted another channel to be able to communicate with them. And at the time we had a few hundred likes on our Facebook page and we shot up to about 2000. So that was in my opinion the most successful campaign we’ve done is by using our custom audience and putting all of our customers in there. Now we have a lot more engagement on Facebook when we go to shoe shows. There are shoe shows around the country where all the manufacturers get together and show in the spring and fall what the next season is going to coming out. So we place our orders– you place your orders like in the fall for the next spring and then the spring for the next fall. And when we are there we’ll actually take pictures– sometimes you are not supposed to, but we do it anyway. We’ll take pictures with our cell phones and post them to our Facebook page and say what do you guys think about this? And they love having a kind of an inside track on what may be coming next season. Steve: So you are getting people who are already on your email list to like your fan page or are you using look alike audiences? Brandon: No we are actually using our customer database, so it could be people on our email list but it’s everyone who has ever purchased anything from us in the past. Brandon: And some of them are on our email list, but it’s many times bigger than our email list was. Our email list is only about I want to say 15,000 right now. Steve: Okay. And so these are just people who have purchased from you and then entered in their email and then you are basically trying to get them like your fan page as another marketing channel. Is that it? Brandon: And we communicate through our page pretty regularly. Any time we are having any kind of promotions or sales, when we are going to the shoe shows or when things are coming back in stock that are really popular items or are out of stock for a particular time, we always post that stuff to our Facebook page. And we’ve been getting some pretty good engagements as we showed up, I mean we still don’t have our 2000 fans but we do get pretty good engagement when we target them. Steve: So do you track the actual sales from that page then? Brandon: We do, it’s not much. Brandon: But even traffic from social is only 1% of our traffic. Brandon: So it’s negligible, but we use it more as a way to keep communicating with our customers. Brandon: Than you know to try to sell them just because it’s such a small part of our traffic right now only having 2000 fans. Brandon: If we get to 10, 15 then I think we’ll probably see a little better conversion on it. Steve: I was just curious because you know Facebook is really down-down the exposure for posts on our fan pages. I was wondering if you’ve ever tried any sponsored stories or retargeting on Facebook as well. Brandon: We haven’t but Facebook retargeting is definitely one of the things I want to do for people again who have been on our site to be able to retarget them to come back and finish their order. I think that might be pretty effective. Steve: Okay and so basically in terms of pay per click, are you just primarily using Ad Words at this point? Brandon: We are because we’re maxing out our spend on Ad Words and we are still not spending a whole lot of money. I think we are spending between 1500 and 2000 a month. Brandon: And we are getting really good return on investment on that money, but you know we are just constantly looking for new keywords and new Ad Groups and we had to expand it and really I just want to spend as much money as I can because it’s a profitable. So I haven’t really spent the time to get Bing Ads up and going because they are going to charge me another having hundred dollars a month. The company we used to manage it to do the Bing Ads and I’m wondering you know I’m I willing to spend 3 or 400 dollars a month if I can only spend 1500 to 2000 on Google. Steve: Actually you could just import it over. Steve: Traditionally in my experience the Bing traffic is on the order of like 10% where Google is, so I wouldn’t expect to see too much but you know an actual boost like that might make a difference for you. One of the things I did want to get into was conversion rate optimization because you’ve mentioned in your talk at the E-commerce conference some of the things that you tried. And I was just wondering if you could elaborate on some of your biggest conversion hits for your site. Brandon: Sure, back in 2007 when my wife and I took over the business our conversion rate was pretty bad. It was 1% or just under 1% of you know all the visitors. And I mean that’s a low even by retail E-Commerce standards. I think at the time 2% was the average, so you know we were getting a descent amount of traffic, we were getting lots and lots of traffic to our site. And I knew we had to do something and this is back when Google Website Optimizer was around, but I had no clue it even existed. I was– I think it was around 2008 maybe early or late 2007, I started doing a free shipping, of course everybody is doing free shipping. We were doing free shipping with the coupon code and we had a banner on every page of our site that said you know free shipping you know coupon code is I think it was free ship with no space in between, and it had instructions on how to check it out. And then on check out we actually had that banner that said free shipping inner coupon code free ship. Still a lot of people were ordering without entering the coupon code and we were just thinking okay well that’s better for us because we’re paying for shipping. But then we strictly got a few people through the email forum that complained that you know you say free shipping on your website, but when I go to my shopping cart it doesn’t have free shipping. Steve: Yeah, it’s in the link. Brandon: Yeah even though you have it on the banner on every page of the website. So I did a test and of course this is not something you really AB test because it is a feature in the shopper cart. Brandon: But I just flipped the switch and make– configured our shopping cart to make it automatically apply free shipping to the continuation you ask when an order total was over a $1000. And we still offered other options but free shipping was defaulted, and instantly our conversion rate went up 50%. Brandon: I mean that’s the by far the biggest single job our conversion rate is taking. So of course we left that went free shipping now just if you live in the States you get free shipping. And that was the biggest part, but that’s what kind of showed me the importance of making changes and testing things to see what works and what doesn’t. So since then we’ve tested a lot of things. We’ve tested seals on different things you know like the buySAFE which did an amazing job for us. BuySAFE was a– I actually read a blog post about it, it was 18.6% boost. Brandon: So it’s probably one of the better ones as well. We did the A B split test on that so I knew exactly what buySAFE did verses the others, now of course over time your customers get used to it. May be it’s not quite as much anymore, but I still think it’s very much worth it. But we did other things like hacker safe, we didn’t do anything to force it, it actually reduced our conversion rates slightly. Brandon: And we’ve done custom manors, we did a custom manor on our shopping cart that just says you know our safe shopping guarantee where we say you know we use some encryptions this and that and that really helped, that gave us about a 10% boost. Brandon: So all of the different things that we’ve done have made a huge impact. We’ve tested our Buy box a lot and now it’s pretty ugly. If you look at our site it’s pretty simple, but our buy box is got this bright red border around and the background is this pale yellow, it’s got bright red text, big bold text at the top of the buy box, and I mean we tested that, and we were getting a lot of people that didn’t know how to put things in their shopping cart. And so we made it as ugly and as bold and as out there in front of their faces as we possibly could and every little thing has increased our conversion rate slightly to the point where our conversion rate right now seeing it over all 3%. It’s actually a bit more than 3% because our mobile conversion rate is awful. We don’t have the mobile website yet. So our conversion rate if you look at PC traffic is like close to 4%, but mobile drags it down a good bit. Steve: Wow, okay that’s really interesting. I never thought– I’ve always been skeptical about those seals but now that you are bringing up that it actually– the buySAFE one opted by 18%, that’s very significant. Brandon: It was a shock to me considering how inexpensive the buySAFE is so much that I read a blog post about it. This was back in 2012 when we implemented it. And I couldn’t be more surprised because we had tried numerous seals in the past and buySAFE had been after me, I’d been an IRCE conference internet retailer a couple of times and those guys had taken me out to dinner and you know they were after me for a new account. And I had always just kind of been like yeah whatever. And so for about a year and a half I think I kept saying yeah one day I’ll sign up, one day I’ll sign up, whatever. And they finally were like dude, do it for free. We are not going to charge you anything. We’ll do the AB test. That at the end of the AB test if you don’t like it just– you don’t have to do it and it really only took about maybe 15 minutes to install 20. So it wasn’t a huge investment of time. Brandon: It was definitely one of the better and that and the free shipping was definitely the two best things that we’ve done. Steve: Okay and then the things you’ve done with your buy box and that sort– so first of all how much traffic do you need to do your AB testing and how long does a typical test take for you to run? Brandon: We don’t have a huge amount of traffic, like our average when we pull up last month– our average is in the tens of thousands of visitors a month. And we were running between 20 and 30,000 and then we’ll head up just 50 and 60,000 visitors during the holidays. So it still takes us weeks to run a test if we are running it on something like the shopping cart or something where you know only a percentage of your visitors are going to go. Brandon: If I run it on like every single product page of the site so through our template system you know every product not just a particular product, it’s usually like maybe a week or two. Brandon: On the shorter sides 7 to 10 days, but I don’t let it get to the point where it tells you it has statistical relevance all the time. Brandon: If it’s trending one way or the other I’ll go ahead and go with it. I’d rather move on to another test or you know find something else to do than let something sit for a month. Steve: Okay and then in terms of social media what percentage of your traffic is social media? Brandon: Social was only 1%. Brandon: Email is 5% of our traffic, but 10% of our sales. Steve: Wow. Okay you want to talk about a little bit of about what you are doing with your email campaigns that are making it so successful? Brandon: Sure we have sent only a few campaigns a month for many-many years, one to two– we rarely do promotions. But when we do send an email we try to do something. So we are showing new shoes that we’ve got in stock for the season, or we are asking for feedback, like we send an email every time we go to a shoe show asking you know is there anything in particular you want us to look for? Anything you’d like us to ask, brands to make. We do that kind of thing but I’ve gotten to where I’m much less shy about sending reminder emails and when our revenue started jumping was when I started sending many several reminders. Many several years ago I would just send one email over a particular sale because I didn’t want to get a lot of unsubscribes. I didn’t want to take people off to where they would just leave and not get any future emails. So I didn’t want– you know I was really cautious about that. And now even though we still only do one to two campaigns what I call campaign a month. During the campaign you know if we have a sale that’s like a really long weekend, say Columbus day is on a Monday and we start the sale on Wednesday I’ll send a Wednesday email, a Friday email and then a Monday email saying that the [inaudible] [00:46:36] and hours left to save. Brandon: So I’m not newly as shy as I used to be in– I just schedule along right when we schedule the original email doesn’t take any more time. We also do the same on Facebook where [inaudible] [00:46:51] online, of course Facebook is such a small percentage of traffic, but we still try to communicate everything through there. And that’s when our sales really started ticking up. And so our conversion rates on email is much-much higher than it is on any other channel. Steve: So this is a key take away from what you said, it’s don’t be afraid to email your customers right, that’s what the list is for. Brandon: Absolutely I mean you going to get some unsubscribes, but we don’t get any more unsubscribes than we did before. Steve: Okay you know one last question and I want to ask you this from the perspective of a beginner. You know if you had to focus on one single tactic when starting out with your online store knowing what you know today, what would that one tactic be? Steve: To get customers on the door. Brandon: I would say if you are trying to get customers in the door and you are brand new, you know Conversion Rate Optimization is not a good thing because you really need some traffic to be able to do it well. So I’d focus on Search Engine Traffic. And I’d say traffic engine not SEO because I’d I would work on working in like a paid at the same time. Brandon: I think it depends on your industry though. I’ve seen a lot of people who just can’t do Pay Per Click because there is no margin in it, if you are drop shipping there is probably not a margin in it. Brandon: But if you have the margin I would definitely go paid and I would find a professional to do it so that they can get your costs down to the point where it’s profitable on one sale. I mean ours is a profitable on a single sale, so if a customer never comes back we still make money, which is almost unheard of in Pay Per Click right now, a lot of people focus on lifetime value of the customer. And while we do have a very high lifetime value I want to make sure that we are profitable enough this month, month to month and we have you know positive cash flow to keep putting that back in the business. Steve: Okay and so you– when you are bidding on keywords you are not considering lifetime value, you are focusing more on how much profit you can make directly from a sale. Is that inaccurate? Brandon: Our customer acquisition cost right now $89. Brandon: Well it depends on gross or net but our average order value is 120. Brandon: That’s with shipping and tax and whatever else might get charged. So we’ve got you know, we’ve got a good 20 to $25 in net profit before you know that we can spend and I’m still going to have money at the end of the month after paying all the bills. So yeah as long as I don’t spend $20 on a new customer I’m really happy. Steve: Okay. And then I assume that once you find something that works you just max it out, right? Brandon: Yeah we are totally max now. We are not even spending– I think on one of my Ad groups I’ve got $75 a day. I think I might be spending 40 on that particular Ad group. So I want it to run day in day out as much as it can if it’s working. Steve: Okay. Awesome Brandon and hey we’ve already been talking for 50 minutes. I don’t want to take up too much more of your time. A lot of good stuff in this interview today, if anyone has any questions for you where is the best place to find you? Brandon: You can find me at brandoneley.com. It’s an E-L-E-Y. I blog there about E-Commerce sometimes and it’s pretty easy to contact me just brandon@brandoneley.com. Steve: Awesome Brandon. Well hey thanks a lot for coming on the show. I learnt a lot and I’m sure the listeners have learnt a lot out of this interview as well. Brandon: Yeah thanks for having me. Steve: All right thanks Brandon. Hope you enjoyed that episode. Brandon’s store 2bigfeet.com is the perfect example of how someone can be successful selling regular everyday staples like shoes. By niching down and becoming the best online store for selling shoes for people with big feet, Brandon has carved out a very profitable business for himself. For more information about this episode go to mywifequiteherjob.com/episode50, and if you enjoyed listening to this episode please go to ITunes and leave me a review. When you write me a review it not only makes me feel proud, but it helps keep this podcast up in the ranks so other people can use this info, find the show more easily and get awesome business advice from my guests. So I’ll say the best way is to support the show and please tell your friends because the greatest compliment that you can give me is to provide a referral to someone else either in person or to share it on the web. Now as an added incentive I’m always giving away free business consults to one lucky winner every single month. For more information go to mywifequiteherjob.com/contest, and if you are interested in starting your own online business be sure to sign up for my free six day mini course where I show you how my wife and I managed to make over 100k in profit in our first year of business. Go to www.mywifequiherjob.com for more information and thanks for listening. Thanks for listening to the My Wife Quit Her Job podcast where we are giving the courage people need to start their own online business. For more information visit Steve’s blog at www.mywifequitherjob.com. Brandon is a facinating speaker and 2BigFeet.com is a great website, very inspiring! This podcast really helped me to gain some actionable intel on how to market our business better.